Heres is the new 2018 Camp GUIDE in PDF format. The Guide provides lots of helpful information about preparations and fun in Camp. Campsites are available on a first-come, first-served basis. Sites cannot be saved or reserved. As this is a wilderness camp, you are responsible for choosing a campsite that meets your safety standards. Please keep in mind that trees fall down from wind and age. Some campsites have fewer trees and are more open than others but no campsite is completely safe from the possibility of falling trees. Also, cupboards, tables, chairs, ridge poles and other unique ‘features’ that have been built by campers from driftwood, dead trees, and rocks may not be stable or secure. No one maintains these structures. Use at your own risk. Wilderness camp has only trees, the lake, the beach, and space — plus outhouses. There is firewood to be found on the beach and around the property and clean water and air. Almost all tasks are done by volunteers, including you. The volunteer camp director collects fees and organizes volunteer boat operators. Boat operators must have a Dept of Transport Boat Operator Card. Other than that, nobody “runs” things. There are basic tools (shovel, ax, saw) available in the camp supplies tent. They are there for you to borrow and return. water carrier, container with lid for anti-critter food storage, can opener. Clothing suitable for warm weather and for cool weather. Rain gear. An umbrella is handy. Swimsuits. Please do NOT bring lumber to camp for building. FOOD: ALL the food you need. Plan your menus in advance and buy to that plan. Food can be kept cool by submersion in the creek or by the use of a “desert cooler.” Be creative. Bungee cords, more tarps, camp cots, some open weave plastic container for creek refrigeration, flashlight, flyswatter, folding chairs, fishing tackle, a canoe or kayak or row boat, camera, hiking gear, field glasses, hobby equipment, games, quiet musical instruments, headsets. To avoid graffiti on the beach, please bring only paint that can be washed off for craft projects. Leave usual kids’ toys at home — they tend to get lost. But do bring water toys — snorkel, mask, floating devices. 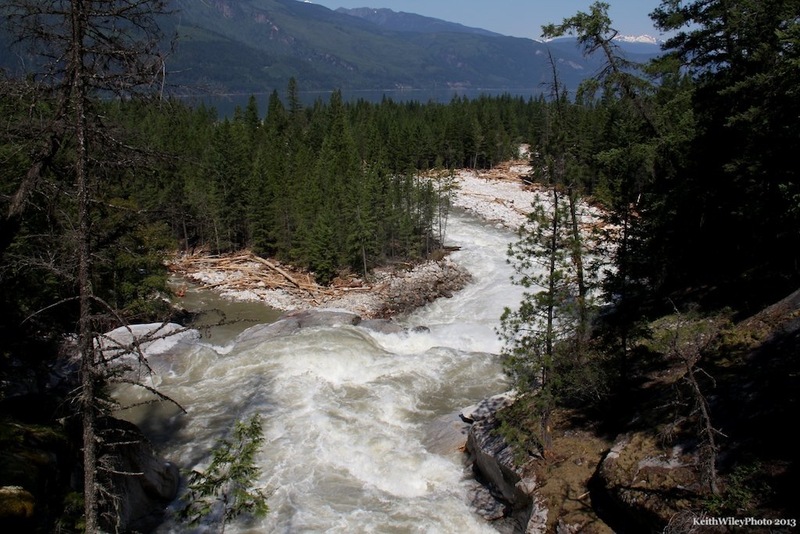 All services can be found in Kaslo, which is 15km south of the pickup point at Schroeder Creek. Also the day before, go to the Camp Director and pay your camp fees. Be SURE your fire is out, and all scraps of debris are gone from your fire pit. Use the rake from the camp supplies tent to tidy up your campsite for the next party of campers. Take ALL your garbage (large, small and broken) and recyclables with you. The Camp Director has an emergency first aid kit and communication devices. Ability to communicate outside the camp may be limited. There is a doctor and a First Aid hospital over an hour away. A full service hospital is over 2 hours away. Obviously, people with specific or chronic medical problems should come prepared, including medications and epi-kits. CELL PHONES: As yet, there is no cell phone coverage at camp. Your cell phone won’t work here. 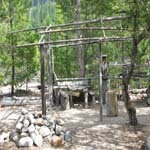 DRINKING WATER: Most people drink the glacier-fed creek water, and use lake water for washing. If you have concerns, boil your water or bring a water filter. Gray water is to be spread around, not poured into a sump hole, the lake or the creek. Washing dishes or cleaning fish should not be done in the creek since there are other campers downstream. There are artfully constructed, roofed pit toilets situated within easy reach (but not too easy) of each campsite. They are repositioned every few years. Maintenance is a volunteer job, including supply of toilet paper, and “knocking down the hills”. Please supervise children in the proper use of outhouses. If toilet paper is low, take it upon yourself to re-supply from the camp supplies tent. In 2000 a group of innovative campers constructed our first composting toilet near the main beach. There is one composting toilet on site. Please follow composting toilet instructions regarding the proper use of wood chips and straw. Flush with water every few days to control any odours. If in doubt, ask the Camp Director. Campers are expected to take care of their own garbage — the camp does not provide disposal. Do not bury food scraps nor toss them into the outback. Burn all waste and food scraps in your fire pit. Cans should be washed or burned, flattened, and taken out with you, together with washed bottles and other non-combustible waste. Do not burn plastic as noxious fumes result. If there is a fire ban, ALL garbage will need to be hauled out. Proper garbage disposal is necessary so we don’t provide attractive scents for small and large animals. When in your vehicle, do not leave garbage by the side of the road and do not dispose of garbage in dumpsters at Provincial campgrounds along the lake. The best places to dump are in nearby dumps. Ask the Camp Director for locations. There is a recycling depot just south of Kaslo. Please do not leave plastic tablecloths behind; take them with you.